CLEVELAND, Ohio -- It had to be Jamie Meder who made the play that might have ultimately saved the Browns from the infamy of an 0-16 season and ended their franchise record losing streak. 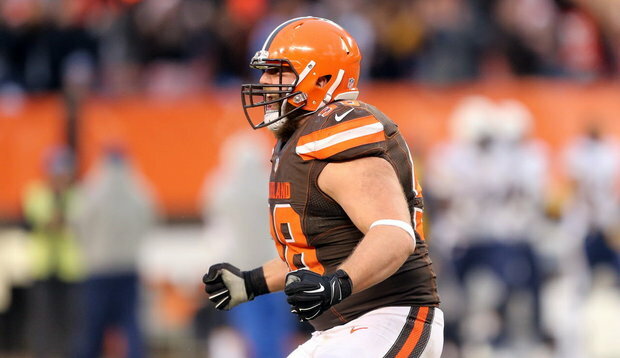 Or, as left tackle Joe Thomas called Meder after the game, "The Pierogi Prince of Parma." Meder grew up in Parma Heights and went to Valley Forge High School. He rooted for the Browns as a kid. So, yes, it had to be Meder who tunneled through the Chargers line to block Josh Lambo's 32-yard field goal attempt with 3:49 left in the game. The Browns were clinging to a 20-17 lead and were very much on their heels. Meder's block helped them dig those heels in just a little bit deeper. "I felt something hit my hand," Meder said, "and it felt good after it." "I didn't hear it, I saw it," linebacker Christian Kirksey said. "It was special. Special moment." Meder used a swim move to squeeze in between Chargers long snapper Mike Windt and guard Kenny Wiggins. He stuck his right arm up and deflected the ball as he began to stand upright, sending the Browns' special-teams unit into a frenzy. "I was staying away from him after because he was going to crush my head like he did earlier in the season," defensive lineman Carl Nassib said. "His celebrations are like the Tasmanian Devil." Nassib, according to Meder, was responsible for freeing him up on the play. "Carl executed it perfectly," Meder said, "helped free me up and (I) just was right there to make the play." "It was mostly Jamie," Nassib said. "Jamie did a great job. It was funny, we were talking right before and he was not really making much sense -- he was like, you back out, no, I'll back out, alright, let's both go. Alright we're both going and then we blocked it, so it was really awesome." Browns head coach Hue Jackson said he didn't have a good view of the play but he was amazed that it happened. "I just heard 'pop,'" Jackson said. "You hear those things. Then all of the sudden, I heard the crowd then I knew all of the sudden something good happened for us." "(Meder) is awesome," Thomas said. "I love a blue-collar guy like that. He is a man after my own heart. You do not hear a lot from the guy during the week, but he is a guy that has fought his way from the bottom and he has made a huge impact on this team. If he was standing here, I would love to give him a hug." If Thomas is handing out hugs, he may want to save one for cornerback Jamar Taylor, too. Two plays prior to the block, the Chargers appeared to have a go-ahead touchdown in the back of the endzone when quarterback Philip Rivers hit wide receiver Tyrell Williams from the 14-yard line on second down. Taylor, though, who was playing press coverage and got behind Williams, recovered to rip the ball out of his arms and preserving the lead. "He actually had it but you've got to keep fighting," Taylor said. "I think that's what today reflected. We just kept fighting and I fought it and I got the ball out." Positive momentum and good plays begetting good plays is something unfamiliar to the Browns this season. But it was evident on Saturday and Thomas gave Meder's block at least some of the credit for Lambo's miss as time expired. "A lot of times people just want to say, 'The kicker missed,' but you force him into those misses with the pressure that you've brought before that with the block," Thomas said. "He's got those things moving through his head. When he has to perform in a pressure situation with the clock winding down, he doesn't get his normal rhythm of the kick. He feels that pressure coming from the edges and up the middle." Meder, in fact, wasn't even on the field for that final kick. Special-teams coordinator Chris Tabor called for the defense to stay on the field as the Chargers were scrambling their special teams unit out to line up. "I was just watching from the sideline hoping they'd miss," Meder said. Meder and every other lifelong Browns fan who had been waiting more than a year for a win.